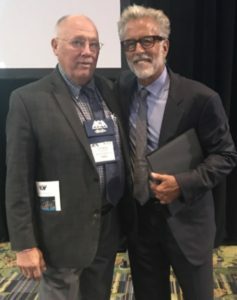 Dismas President/CEO Ray Weis (left) was on hand for the 2018 American Correctional Association Conference Luncheon in which Christopher K. Lawford was the guest speaker. Lawford, who spent 20 years in film and television as an actor, lawyer and producer, is the author of two New York Times best selling books on addiction. In recovery for more than 30 years from drug addiction, in 2011 Lawford was named Goodwill Ambassador for the United Nations Office on Drugs and Crime to promote activities supporting drug treatment, care and recovery. He has also aided the White House Office on Drug Control Policy, the World Health Organization and has consulted with Fortune 500 companies.